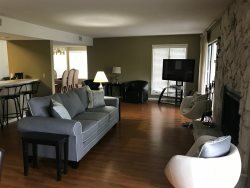 This Lands End 2 Bedroom / 2 Bath condo is located in the heart of Osage Beach, in one of the most desirable locations we offer. Land’s End is a family-oriented development and is situated at the 19MM of the main channel of the Osage, making it close to everything by both water and land. The amenities boast of a zero-entry pool with water continuously fed into the pool by a beautifully decorative waterfall! A family area including a fenced-in children’s waterpark (with lazy river & separate children’s playground)! The condominium is a first-floor unit with elevator access just steps away from the front door. The Master Bedroom / Bath is furnished with king bedding. The Second Bedroom offers a Queen Bed and a Queen Sofa Sleeper is available in the living area. This condo offers a balance of comfort, convenience and desirability! Sleep 6 adults.